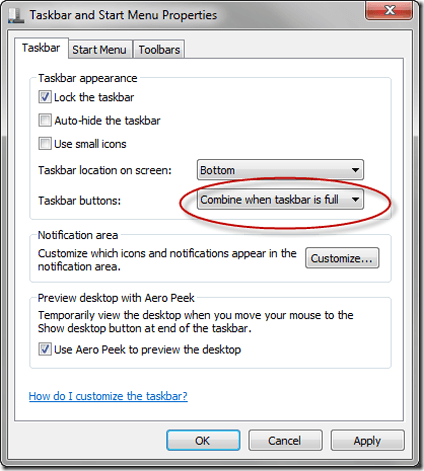 The Windows 7 taskbar, as most everyone knows by now, is far more versatile than anything seen in Windows before, but what many people may not know, is that there is a lot more you can do with it, than simply pin things or use jumplists. First, for those that don’t know, applications can now be “pinned” to the taskbar; which means dragging them to the task bar, where they will stick, until such a time as you choose to unpin them at a future date. To pin an application, click on the Start icon, then right click on one of your applications and drag it down to the taskbar; when you get there, let go. Windows will create an icon for that app. 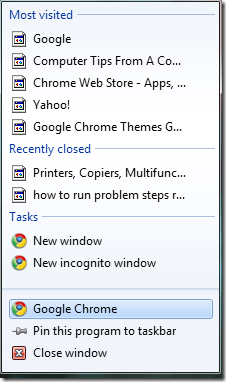 Then, from this point on, to launch that application, all you have to do is click on it on your taskbar. This is a jumplist for Google Chrome, note how it displays the sites you’ve most recently visited, and those that have been most recently closed. 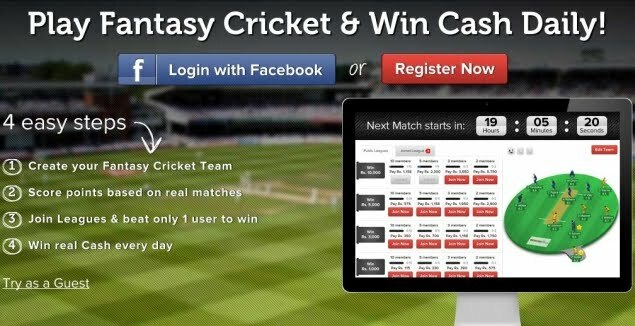 The things that show up on your jumplist depend on the kind of application you’ve pinned. For example, if you’ve pinned Word, you should see the last x number of files you’ve loaded in it. To jump to the one you want, put your cursor over the preview that shows what you wand and click on it. 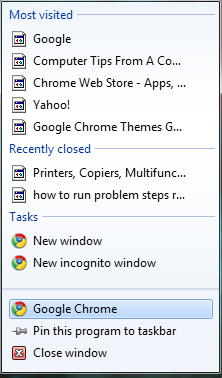 Note how the above icons for Word and Chrome are wider than those for Sticky Note and the Magnifier. Many people have also complained that the taskbar is too big, and thus takes away valuable screen space. You can fix this also by making the icons smaller; to do that, right click once again on the Start icon, choose Properties, and then check the box next to where is says Use small icons. Your taskbar should look this this after you click Ok. Note how the icons are much smaller after choosing this option. Also note that your taskbar now looks as it did in Windows XP. 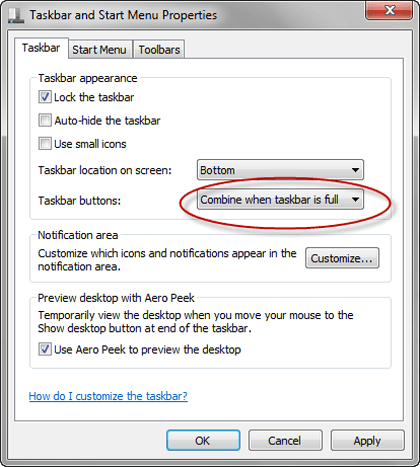 The the taskbar properties menu can be used to change a lot of the things you may or may not like about your taskbar; to see which you would like to change, it’s best to look them over and try out the ones you like. To sum up, the taskbar in Windows 7, like almost all of the other tools and menus, can be customized and changed to suit your needs; all it takes is getting familiar with the properties menu.